How can mobile technology enhance and publicly disseminate environmental historical scholarship and digital humanities themes? How can mobile technology expand our ideas of digital, online archives and create new partnerships between scholars, land managers, and the public? 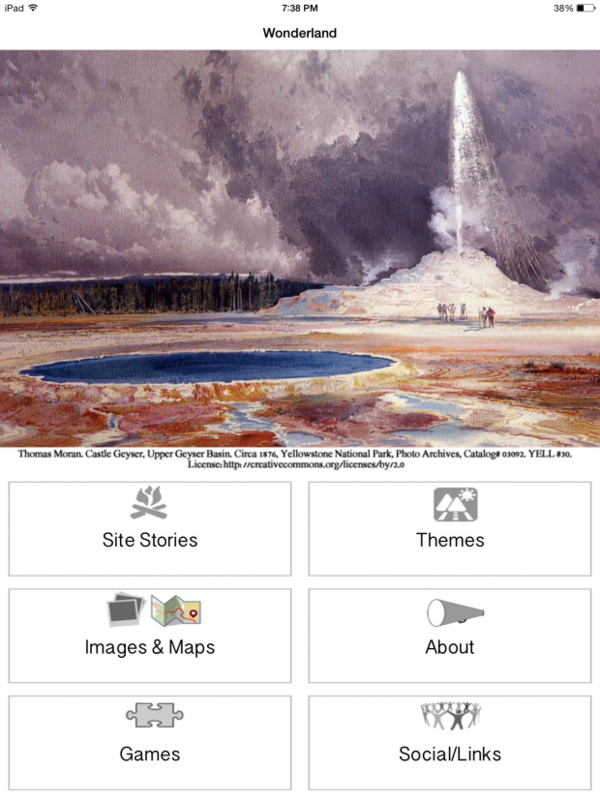 These are a two of the questions we are exploring through the creation of a “Digital Wonderland”—a mobile app that presents the environmental and cultural history of Yellowstone National Park, Wyoming, U.S.A. Mobile technology such as mobile phones and tablet computers are becoming an indicator species of modern tourism. One would be hard pressed to visit Yellowstone National Park these days and not encounter tourists raising their tablet computers or mobile phones in the air to capture photos of an eruption at Old Faithful geyser or a roadside spotting of a grizzly bear. 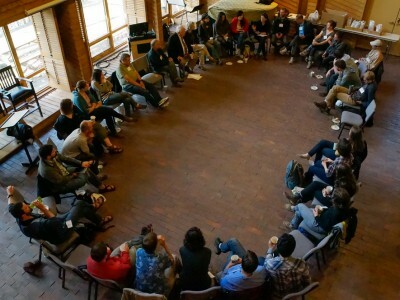 But there’s more to this technology’s potential for digital humanities than a quick photo. These devices travel with tourists in their cars as they drive the park’s loop roads, in hotels as they relax after a big day of hiking in the park, and back at home as they sort through their photos, videos, and notes from their vacations. These devices offer a tremendous but relatively untapped opportunity for environmental historians, cultural geographers, and other scholars to reach broad public audiences. Through mobile apps, for example, scholars can presenting interactive, interesting, but perhaps rarely shared with non-scholarly audiences stories about historic places, people, and events in an versatile and easy to update venue. While there is a quickly growing roster of companies that offer mobile apps for national parks, few of these apps are created by teams of scholars working with digital media developers, museum and archivist specialists, national park managers, and non-profit education associations. There is an opportunity here disseminate environmental historical scholarship and digital humanities themes to a broad public audience. Tourists may be interested in this scholarship, but they may not have access, time, or the resources to explore this information. 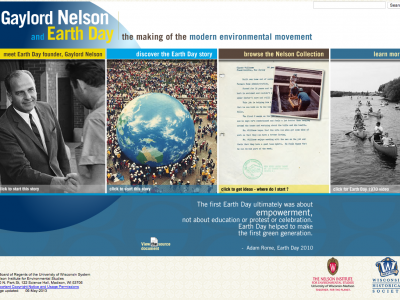 Mobile apps can fill this need and expand the impact and exposure of environmental history scholarship. In addition, mobile apps offer a creative way for archives and museums to present their digital collections to a public audience in the context of specific places. As an example, our Digital Wonderland app is a collaborative and interdisciplinary project that brings together scholars from history and geography with digital media developers, non-profit public education organizations, and National Park Service museum and archivist staff. Image 1. Screen Shot of Splash screen for the Digital Wonderland app. 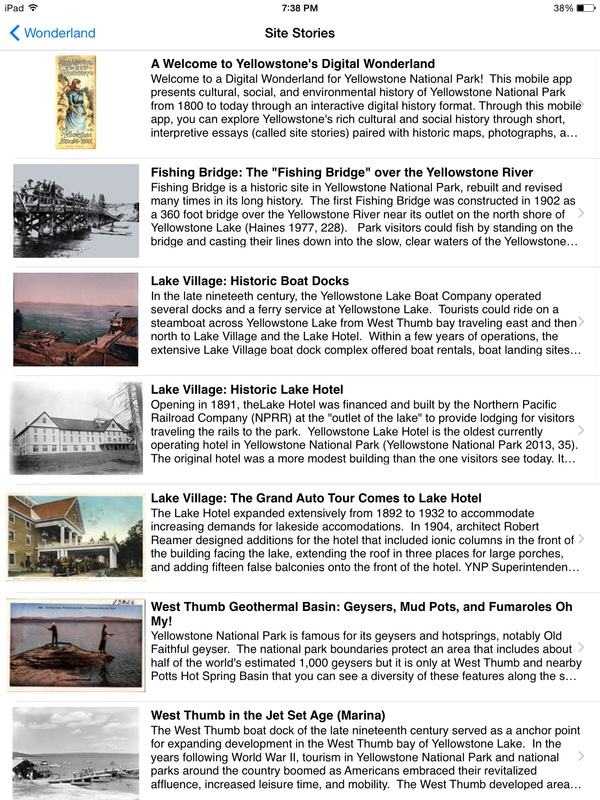 We recently completed the first phase of the project, the development of a prototype, that features short, scholarly essays about specific locations in the park with cultural, environmental, and historical importance (called “site stories”), archival maps, postcards, and photographs, Geographic Information Systems (GIS) maps, interactive games, and social media. Image 2. Screen Shot of home screen for the Digital Wonderland app showing various features such as site stories for the Digital Wonderland app. The site stories are short essays based in scholarly research, written by content expert faculty and graduate students, and presented in a non-specialized language for public audiences. Image 3. 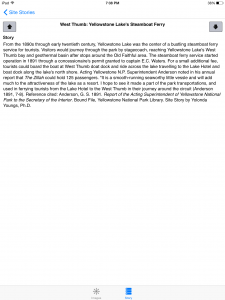 Screen Shot of list of Site Stories and imagery for the Digital Wonderland app. The work integrates archival research, field data and observations, historic photographs and imagery, and GIS datasets. 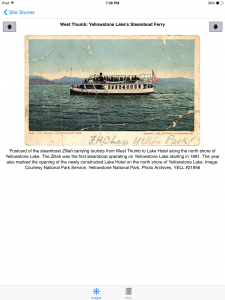 The prototype is focused on Yellowstone Lake’s diverse and often overlooked cultural and environmental history; however, we are working to develop additional partnerships, collaborations, and grant funding to expand the project for additional Yellowstone National Park sites in the coming years. Image 4. 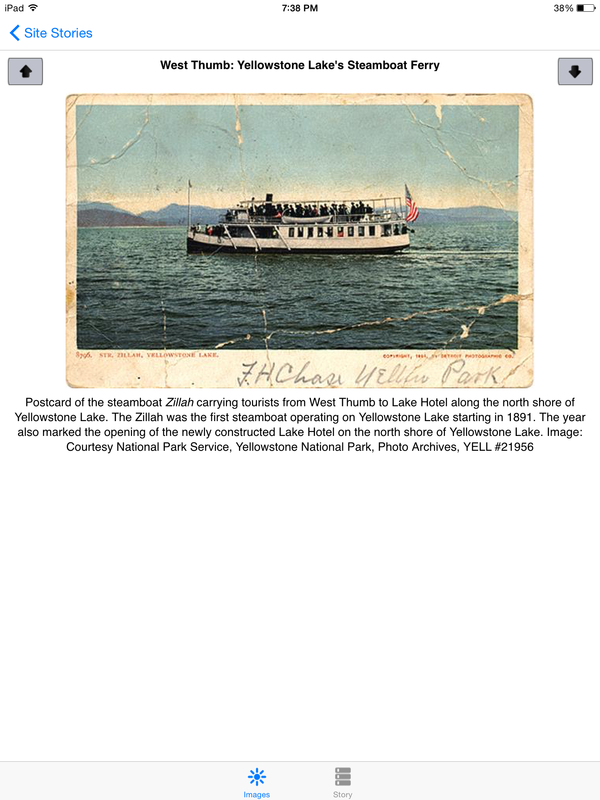 Screen Shot of a caption for an archival postcard that accompanies the site story for the historic Yellowstone Lake steamboat on the Digital Wonderland app. Image 5. 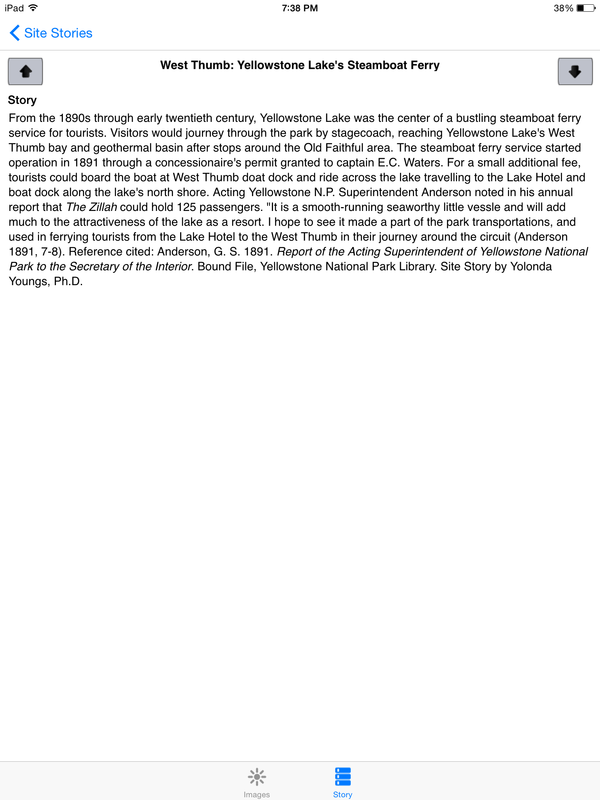 Screen Shot of the site story for the historic Yellowstone Lake steamboat on the Digital Wonderland app. Dr. Yolonda Youngs is an Assistant Professor at Idaho State University and the Project Director for the Digital Wonderland app. 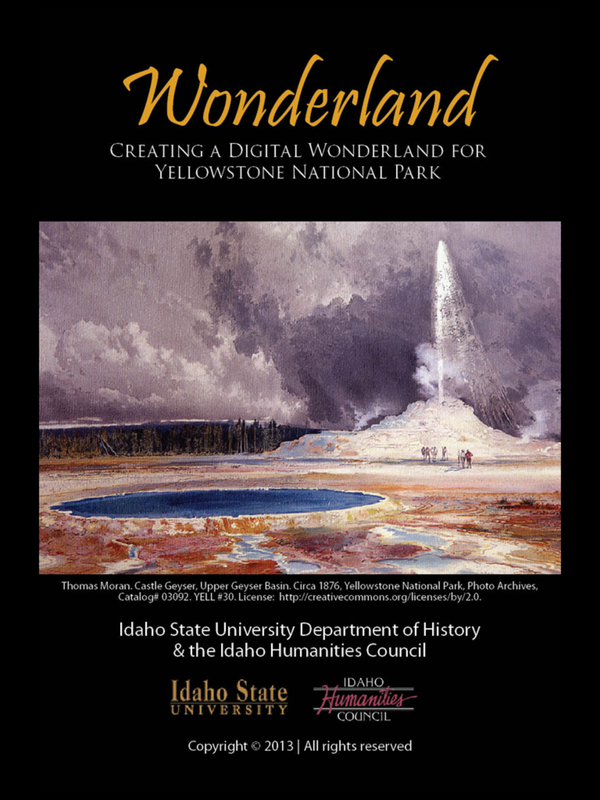 Her Digital Wonderland project co-authors are Dr. Kevin Marsh, Professor, Department of History at Idaho State University and Katie Gibson, mobile app developer for MountainWorks Software in Bozeman, Montana. Dr. Youngs may be reached at younyolo@isu.edu. This prototype app development project was funded, in part, by a major grant from the Idaho Humanities Council (Grant #2013018).